The Birch Grove and Area Source Water Protection Planning (SWPP) Committee has been meeting since December, 2008. This committee prepared source water protection plans for the thee watersheds shown in the map below. 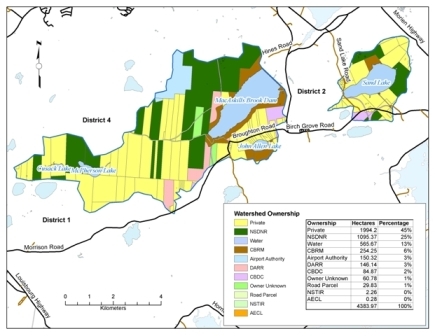 The map above shows land ownership in three watersheds. Click here to view larger version (pdf). The committee developed a Terms of Reference which is linked below. Approved minutes of the Birch Grove and Area SWPP Committee are also linked.